…what if your food is a frozen brick? Can you reheat frozen foods in the Instant Pot electric pressure cooker? Can you “cook” your pre-prepared freezer meals in the Instant Pot? First, I love your blog and site! So much great info! I'll cut to the chase, you have talked about converting crock pot recipes for the Instant Pot but what about if it is a prep ahead “freezer meal”? How do you calculate the time if it's still a frozen block? Thanks! I know we all love to cook in our Instant Pots on the spot — like my FREE Instant Pot Sourdough Cornbread Recipe. However, we also like to batch cook and cook ahead. 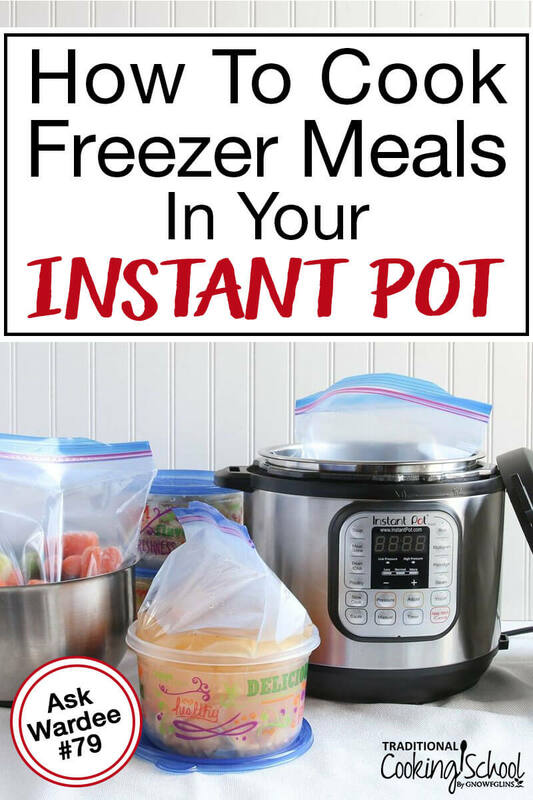 The Instant Pot makes freezer cooking (or reheating of frozen leftovers) easier than ever! Instead of freezing your foods flat in a freezer bag (most often recommended for freezer cooking), use a round container for freezing your food. Be sure to use one that would fit inside your Instant Pot, so the shape and size of the frozen “brick” are right for later. Either freeze the food right in the bowl, or freeze inside a freezer bag that you put inside the bowl. I like the round 4-cup and 7-cup Pyrex bowls to minimize our use of plastic. Plop your food out of the container or bag — which may involve a bit of thawing and/or cutting. If it's frozen in a glass bowl, put it in a bowl of warm water to soften until it “plops” out. Now choose #1 or #2 — already cooked or not yet fully cooked to get your dish table ready. 1. If your dish is already cooked… use the Steam function for 5 to 10 minutes (with the lid locked and sealed) to reheat the dish. Quick release pressure and check if it's done, adding more time as needed. This is very similar to how we reheat non-frozen foods as I showed you in #AskWardee 047 and you'll find more particulars at that episode. Keep in mind that if your cooked dish contains cheese or dairy, it's best to reheat it in a glass or heat safe bowl, covered, on a trivet, with a few cups of water in the Instant Pot insert pot. 2. If your dish is not already fully cooked… (a la Once a Month Meals prep ahead freezer meals), follow the original recipe's pressure setting and timing, without adjustment. Yes, without adjustment — including the pressure release method and timing. Example: the original recipe calls for 30 minutes on high pressure with a natural release of 5 minutes. You would do that with frozen contents as well, after adding the 5 minute Saute from Step 2. How is this possible? Well, it's because all the frozen food does is make the Instant Pot take longer to get up to pressure. During that time, it thaws. By the time it's up to pressure, you're then dealing with thawed foods — so the timing should be the same, right? Pretty easy! What If It's Not Done? Your reheating time could be more (or less) and it usually comes down to the amount of food you're reheating. If you've doubled a recipe, you might need to add more time to reheat/cook it. In that case, after releasing pressure, add more time if you need to. Want More Instant Pot Freezer Meals? Once a Month Meals is my favorite place to get them! And just FYI: at the Once a Month Meals blog, you'll find lots of recipes available free. Yet if you want help putting the menus, shopping list, prep steps, prep day instructions and cooking day instructions, sign up for a free trial mini-menu at this link (scroll down to the bottom). Do you use your Instant Pot for freezer cooking? What timing/methods do you follow? Glad to hear you’re enjoying the site! I am so in love with the Idea of once a month meals I will be joining on payday… Thanks for sharing the info!!! One thought… if your container is glass, you might want to run some cold water over it it, then adjust it to warm water (over about 5 seconds) before you place it in the bowl of warm water rather than placing the freezing cold Pyrex directly into warm water and potentially cracking the glass. Pyrex is tough, but not indestructible and in my experience this is a good tip to follow. Can you reheat from frozen with the contents still in the frozen container (i.e. glass mason jar)? If I freeze soup in mason jars can I just reheat pot in pot from frozen? This would utilize containers I already have (and not use plastic) as well as save a step. Thanks in advance. We have not reheated directly in glass jars from frozen. I appreciate the information you are providing here. One thought: you’ve made it so that readers have to search through ALOT, reading pages and pages of journal entry to try to find the information you linked to. Your readers are more likely to come back if you make it easier for us. Thank you very much for your feedback, it is greatly appreciated. I have passed your note onto Wardee.